Please scroll down to see an image of the Purgolders United Annual Scholarship Social invitation. Please either click on the links below to obtain your own copy or click the Online Registration link to see further information. Thanks! A fun evening for Purgolders! 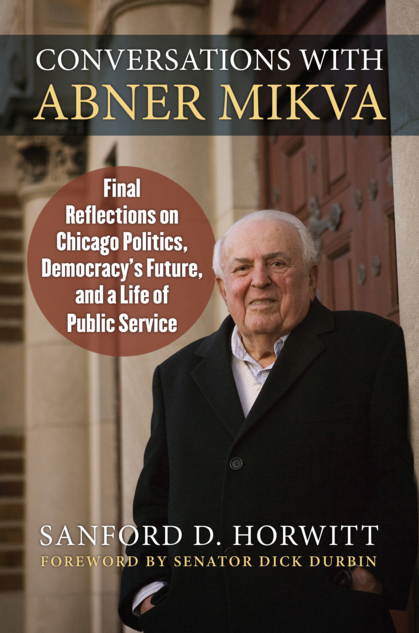 On Tuesday, December 4, 7 PM, at Boswell Books, 2559 N. Downer Ave.--Sanford Horwitt '61, author of Conversations with Abner Mikva: Final Reflections on Chicago Politics, Democracy's Future and a Life of Public Service. Mr. Mikva is not only a Washington HS Hall of Fame member but also received the Presidential Medal of Freedom in 2014. Horwitt will be interviewed by Milwaukee Journal Sentinel reporter Mary Spicuzza. ...Mary is the daughter of Bob Spicuzza who was a teacher/counselor at WHS for many years from the 1960s into the 1990s. 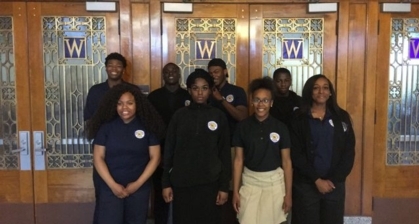 We Need Your Help to continue to offer scholarships and other academic support to current WHS Purgolders. 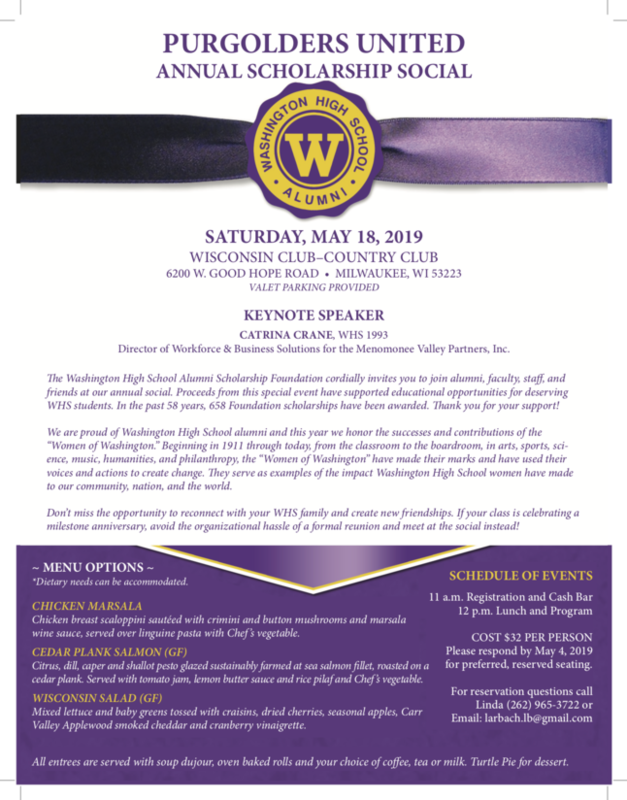 Please consider a donation to the WHS Alumni Scholarship Foundation. Any donation you provide will be very much appreciated. Now that we're into 2018, we continue to seek donations as we prepare to have WHS students apply and interview for schoarships. 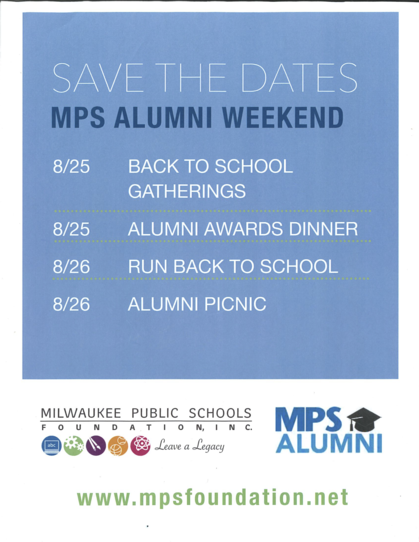 If you choose to make a donation, please make your check payable to WHS Alumni Scholarship Foundation (WHSASF) and send it to us at PO Box 170321, Milwaukee, WI 53217. You can also donate online by using the Donate button on the upper right of this site. Our theme: "It's a Family Affair"
Our 2018 Purgolders United Annual Luncheon is just around the corner on May 19, 2018. The theme of the event is “It’s a Family Affair”. 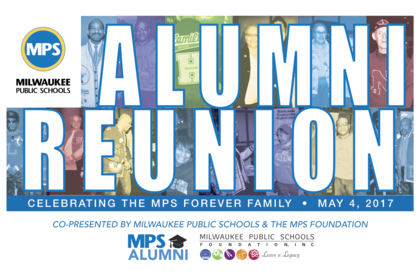 At Washington High School we have always considered our alumni, teachers and staff as part of our extended family. For many WHS Alumni, you also have the unique experience of having shared Washington memories with your mother, father, siblings, aunts/uncles, cousins and/or children who have also attended or are currently attending Washington. We encourage you to share with us the names of your family members who have attended Washington either with you, before you and after your time at our alma mater. We will use this information to help us shape our 2018 luncheon. Here's what we need: for each family member we need first name, last name in school and married last name (if different); how you are related; the class year for each; optionally please supply their email address. To see a larger pdf image of the Save The Date flyer above, please click the image above. In addition, we have partnered with HRBlock nationwide for this promotion. 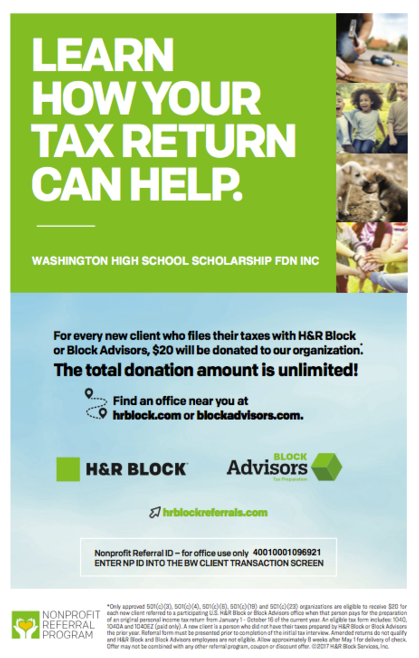 Go in to any HRBlock to have your taxes completed and HRBlock will donate $20 to our foundation! Please see the flyer below for details. The next Youth Works Mentor opportunity will be Thursday, January 25, 2018. Volunteer male mentors are needed for this program serving young WHS African American males. 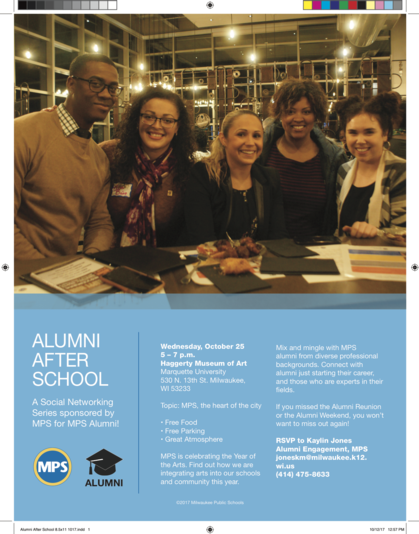 WHS alumni are encouraged to consider this opportunity. Please see this page for more details. Prospective mentors should contact Justin Roby, the person noted on the page as soon as possible to become involved on this date or a future date..
NVAM is pleased to announce the opening of a new exhibition featuring the work of Vietnam veteran artist, Richard J. Olsen. This exhibition showcases prints and paintings made throughout Olsen’s career. The exhibition will open on May 19th, 2017 with a reception from 6-9 PM. Olsen served in Vietnam as a helicopter pilot early in the war, before the countryside was ravaged by bombing and defoliation. His approach to art reflects his optimistic personality in that instead of merely fixating on the horrors of war in his work, Olsen also considers the multi-faceted beauty of the country and uses imagery that invokes the mythology, history and cultural landscape of Vietnam in tandem with his own wartime experience. Midway through his career, after struggling to find subject matter for his paintings, Olsen looked to an artist cliché: “If you don’t know what to paint, paint your studio wall”. After a period of experimentation, these vibrant, large canvases became a fully realized series of work in which Olsen brings the Vietnam War to a universally understood plane of existence through allegory–in this case defined as a metaphor whose vehicle may be a symbol representing real-world issues or occurrences that illustrate complex ideas. In both his “Wall” series and his other work, Olsen links the pictorial artifacts of his Vietnam wartime experience to larger concepts in order to convey an authentic idea of war. These selected works will be on view from May 19th to August 12th 2017. 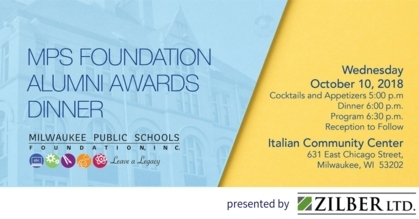 --> more info about their awards coming soon! WHS has been selected to participate in the Doors Open Milwaukee event on Sunday, September 18, 2016. Stay tuned for more information here and via email. Thank You Class of 1966! For your recent (July, 2016) and very generous donation to our WHS Alumni Scholarship Foundation. You can scroll through the pictures or if you want to view a slideshow, click on the left of the three icons over on the right side under "184 photos". Nikiya was featured in the Point of View page in the March, 2014 issue of Milwaukee Magazine. She was interviewed by Barbara Miner. Nikiya was our featured speaker at last year's Annual Alumni Scholarship Social. Take a look and be proud of yet another successful alum from our excellent school! Mira was one of many fine students at Washington HS and a member of the Computer Specialty Program. On matriculating to UW-Whitewater and joining the Track and Field Team, Mira qualified for every national chanpionship during his career, four indoor and four outdoor. He held UWW school records in the 55 meters indoors, and the 100 and 200 meters outdoors when he graduated. Mira won the 55 meters indoors and 100 outdoors at the WIAC Championship and qualified for both national meets again, racing to a third place in the 55 meters indoors at the NCAA Division III championship and winning the 100 meter dash at the '94 NCAA Division III outdoor meet. He earned All-America status three times during his career. Since graduating from the University of Wisconsin-Whitewater in 1995 with a Bachelor's degree from the Management Computer Systems (MCS) program he has worked for several Information Technology concerns and most recently has taken a position as Service Monitoring Project Manager for the Washington DC Metropolitan Area Transit Authority. He has many accomplishments and even speaking engagements as a result of his work for WMATA. During the time he worked in the Milwaukee area he served for several years on the WHS Advisory Board for the Computer Information Technology Academy as a valued member and resource. 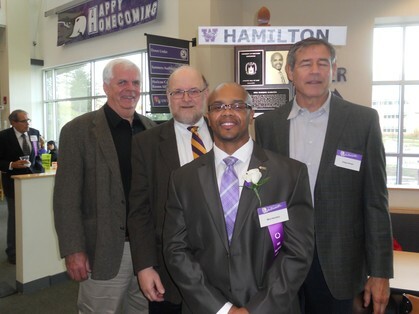 We congratulate Mira on his induction into the UWW Athletic Hall of Fame, thank him very much for his service back to Washington HS and wish him well in his future endeavors. Another successful WHS Alumni! we are proud of! Have Memories you'd like to share? Write new memories or copy them from your profile. First time visitor? Click on "How To Use This Site", located on left. Through one of our committee members, we are aware of a different site calling themselves the WHS Alumni Site. The URL includes the name < Alumniclass.com >. This site is currently seeking funds for memberships. AlumniClass has earned a grade of F by the Better Business Bureau for not dealing with numerous consumer complaints. PLEASE DO NOT SEND THEM ANY FUNDS. None of this money comes to our official WHS Alumni Scholarship Foundation, Inc. We do not charge alumni any membership fees. Classmates.com is another site you should avoid - they have been sued for illicit business practices, particularly for autorenewal of membership fees. If you Google either of these sites along with the term "business practices" you will get further information. There is at least one commercial reunion site which has for sale various items of WHS apparel and other kinds of WHS gifts. We are not associated in any way with any of these sites. No portion of the purchase price of any item on these sites is returned to the Washington HS Alumni Scholarship Foundation. We will be announcing shortly a WHS Alumni Store where we will sell caps, t-shirts, sweatshirts and other memorabilia. When you first register or later if you click on Profile Subscription you can choose to follow one or more of your classmates. When you select each individual classmate, you are subscribed to that person's profile and will receive a message when they update their profile. There's a large button right below the selection boxes labeled "Subscribe to all Profiles". Don't click this button unless you want to be deluged by emails indicating someone (anyone) on the site has changed their profile. If you are getting many emails about profile updates, click on Profile Subscriptions, then scroll down to the button marked "Unsubscribe from all Profiles" and click on it. That should stop those emails. If you're still having problems, send a message via Contact Us.